Amazing things happen at the monthly outings of In Canberra Tonight. 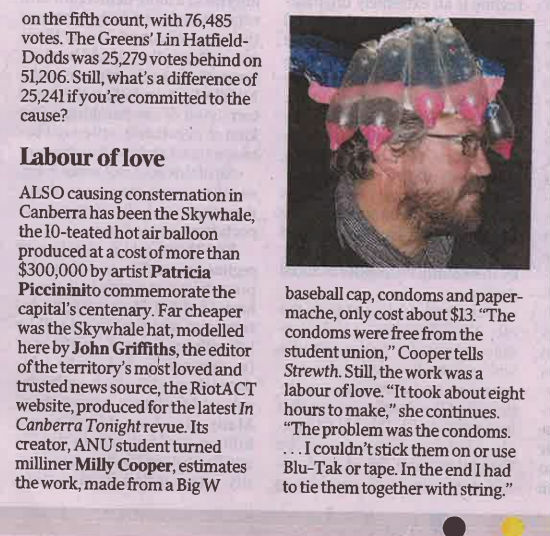 One of them was I had my photo taken wearing a Skywhale hat. More remarkable still was the photo being picked up first by the Terror’s blogs. And now by the Australian. It’s fair to say Skywhale has exceeded all expectations. Now can we please have some merch? Needs to be 3D but. If the t shirt had the hindenboob bursting out, like the Alien, that could be quite good. Maybe. It’s more suited to being a hat, however, due to its design. Earrings possibly. No that’s not right. It’s got to look like the turtle thing with the weird gob, the odd tail with claws, and all the accoutrements. And it’s from Etsy, ugh. Actually, if someone made a bunch of hindenboob hats, they’d sell pretty well on Etsy, they love weird stuff. I need a front on photo then. I’ve been lazy and fairly well been oblivious to this topic. If I have an idea of what it looks like by before lunch tomorrow I can start it tomorrow. At the risk of sounding precious, I don’t want there to be merchandise, or at least ‘official’ merchandise. I’d rather just have the memory of the Skywhale and a few photos. What fascinates me about this now famous hat photo is the way that JB’s expression doesn’t seem to be affected by the fact that there’s such a remarkable object on his head. Like it happens all the time. I want a HAT, just not that hat. A proper one, made of felt or something, they’d sell like hot cakes. Especially with ski season coming up. And outdoor lightshades, it’d be perfect for those. Come on ACT Gov’t, do you have IP rights for merch? Imagine the profits, they’d sell all over the world. You coudl abolish stamp duty on RE. A knitted/crochet skywhale beanie? It would be easier to make out of wool but felt would be quicker. I think I could do that. sounds like a challenge. Finally some national exposure JB and that’s the pic you get it for! Geez, I reckon a mug shot would have been better! Hahaha! Free condoms from the student union….